Third quarter earnings season is set to be another blockbuster for bottom line growth, with EPS expected to grow above 20% Y/Y for the third quarter in a row, and yet some problems are emerging as traders begin to fret what happens in 2019 after the anniversary of the Trump tax reform pushes earnings growth sharply lower and when tariffs from the trade war with China adversely impacts corporate margins. For one, despite the still impressive earnings growth, reported revenues have been a modest disappointment so far, with only 64% of companies reporting actual sales above consensus estimates and 36% reporting revenue misses: "only" because this beat hit rate is below the 1- year average of 73%, suggesting that analyst estimates for top-line growth are aggressive and/or top-line growth may have peaked. But another, more troubling indicator has been observed in the market's response to company earnings beats and misses. 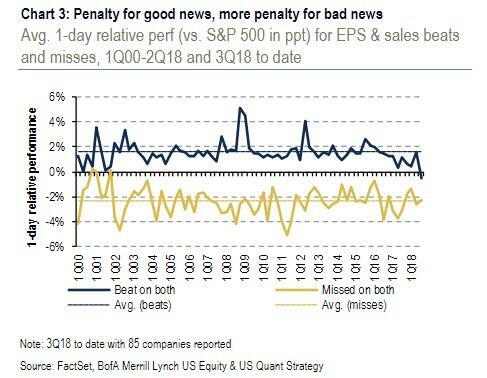 As BofA notes in a Monday morning note, this observation that "good news are now bad news" means that all earnings upside has been fully priced in, resulting in negative alpha for beats. Specifically, as FactSet notes, in a curious twist companies that have reported positive earnings surprises for Q3 2018 have been punished on average by the market, with their stock price decreasing by -0.5% two days before the earnings release through two days after the earnings. Meanwhile, and as one would expect, companies that have reported negative earnings surprises for Q3 2018 have an average price decrease of -3.5% two days before the earnings release through two days after the earnings. This percentage decrease is larger than the 5-year average price decrease of -2.5% during this same window for companies reporting downside earnings surprises. While the market penalizing companies for earnings misses is hardly a surprise, the lack of reward for EPS & sales beats is typically a later-stage bull market signal according to BofA strategist Savita Subramanian who writes that "this suggests that the good news is priced in." Putting these market reactions in context, the only time when the market had a sub-1% relative surprise reaction for beats was in both 1Q00 and 4Q07. And while we've seen similar sub-1% reactions in four of the last six quarters since 2Q17, including in 3Q18 to date, what is most troubling is that this is the first time since the launch of Regulation F.D. in August 2000 that the market has reacted negatively to earnings beats. In other words, the market is doing something it hasn't done in 18 years, with the last time such a response was observed was just as the dot com bubble was bursting.